LMAN1 antibody recognizes protein ERGIC-53, also known as endoplasmic reticulum-golgi intermediate compartment protein 53 or intracellular mannose specific lectin. This antibody has been extensively validated for western blotting using whole cell lysates. Mouse anti Human LMAN1 antibody recognizes LMAN1, also known as ER-Golgi intermediate compartment 53 kDa protein, endoplasmic reticulum-golgi intermediate compartment protein 53, intracellular mannose specific lectin, intracellular mannose-specific lectin MR60 and protein ERGIC-53. Encoded by the LMAN1 gene, this protein is a type I integral membrane protein localized in the intermediate region between the endoplasmic reticulum and the Golgi, presumably recycling between the two compartments. It is a mannose-specific lectin and is a member of a novel family of plant lectin homologs in the secretory pathway of animal cells. Mutations in the LMAN1 gene are associated with a coagulation defect. Using positional cloning, the gene was identified as the disease gene leading to combined factor V-factor VIII deficiency, a rare, autosomal recessive disorder in which both coagulation factors V and VIII are diminished (provided by RefSeq, Jul 2008). 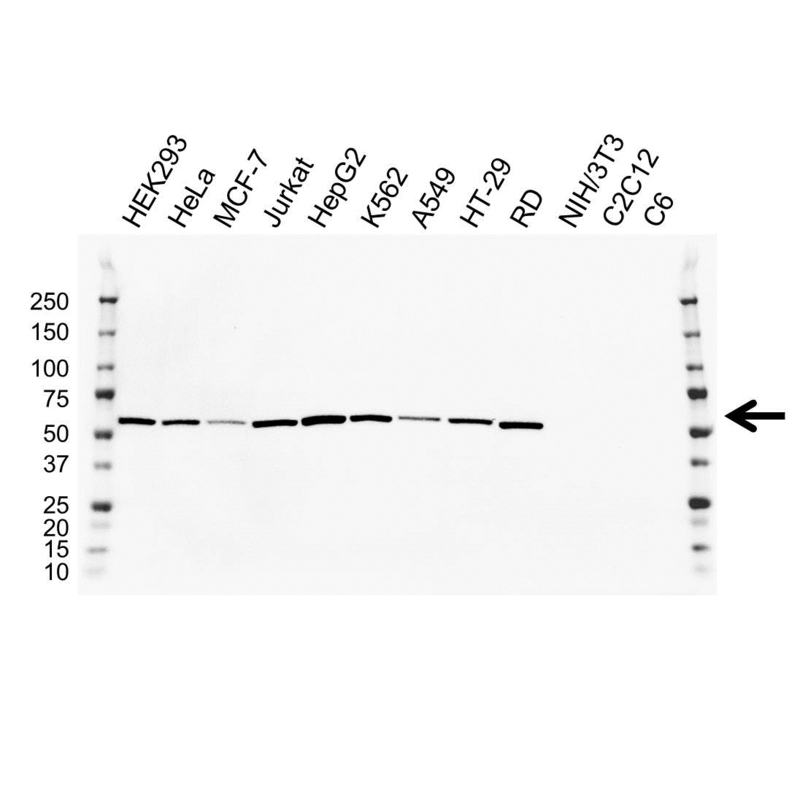 Mouse anti Human LMAN1 antibody detects a band of 54 kDa. The antibody has been extensively validated for western blotting using whole cell lysates. Anti LMAN1 detects a band of approximately 54 kDa in HEK293 cell lysates.